Kodagu is another name of Coorg. Coorg proudly called the Scotland of India. Coorg is an administrative district in Karnataka, India. Coorg is the small town is gifted with abundance. Coorg is the biggest producer of coffee in India, & the best location to visit in Coorg are its picturesque coffee plantations. Lavish greeneries and forests covering up the hills that are popular for trekking and scenic beauty like waterfalls and viewpoints. You can trek to the highest point of Tadiandamol, the second most noteworthy pile of Karnataka. Coorg from Bangalore: 248 km. Coorg from Mysore: 107 km. Coorg from Ooty: 236 km. Abbey Falls: One such breathtaking view in Abbey Falls makes for one of the most famous places to visit in Coorg. situated 1 km from the town of Madikeri, the waterfall is situated between coffee plantations and spice estates. Enjoy the charming beauty where the Kaveri River cascades down a rockface turning into the falls. 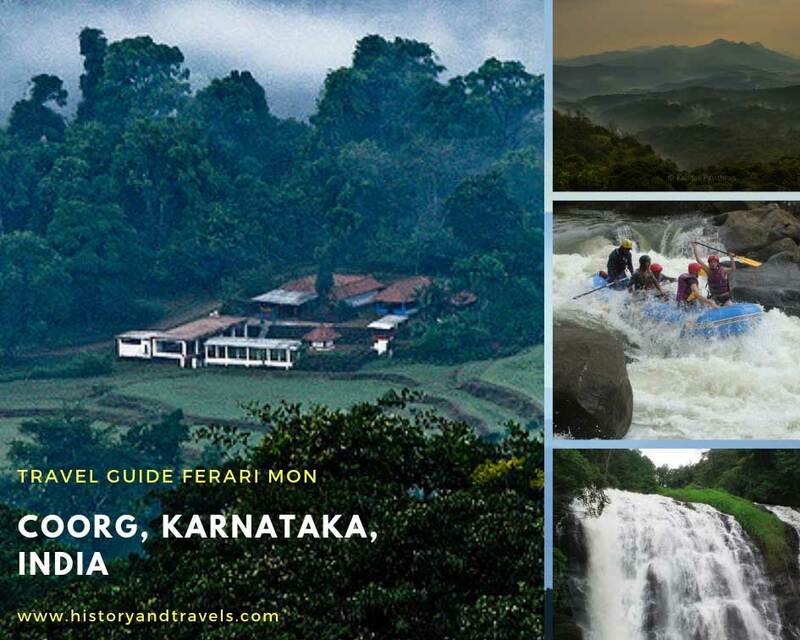 One of the best place to visit in Coorg. Talacauvery: The place of origin of the Cauvery river from the Brahmagiri Hills, Talacauvery is most sacred and hence attract many traveller or devotees. Golden Temple Namdroling Monastery: Coorg is home to the famous Namdroling monastery. Namdroling monastery one of the best place to visit in Coorg. It is located just 6 Kms from the town of Kushalnagar and 35 Kms from the Madikeri. It belongs to the Sangha community. The temple is named "golden" because of the golden work done on every painting. It’s a typical Tibetan monastery. Iruppu Falls: Of all tourist spot in Coorg, Iruppu waterfall is one of the most famous. The wonderful view of the ferns along with the gushing sound of the falls makes for a memorable experience. The mesmerizing view of Iruppa Falls deserves to be on your list if you spent only one day in Coorg. Nagarhole National Park: Nagarhole National Park is one of those best places to visit in Coorg, Karnataka. If you are a wildlife lover, the Nagarhole National Park is possibly one of the best places to visit in Coorg in one day. Despite the dense forest, it has open sight-lines along the river bank, which makes for a beautiful place to watch animals and over 270 species of birds. The best time to visit is during summer in April to May or winter from November to February. Mandalpatti Viewpoint: Mandalpatti Viewpoint is one of the topmost places to visit in Coorg. With a lot of greenery, trekking is definitely one of the things to do in Coorg, tourist places for this activity too are in abundance here, but Mandalpatti is considered the best. Climb up towards the Mandalpatti View Point via the wonderful course however make sure to pack some water for the route as you investigate a standout amongst the best trekking spots in Coorg. Dubare Elephant Camp: There are many interesting things to do and places to visit in Coorg be it with your family, friends or solo. One of the most amazing things to do in Coorg is getting close to elephants at the Dubare Elephant Camp. With over 150 elephants, the camp is a great place to get to know these enchanting creatures. Pushpagiri Wildlife Sanctuary: Situated in Somwarpet taluk. Pushpagiri Wildlife is known to be home to jeopardized and rare birdlife. The wildlife sanctuary also has a forest reserve known as Kadamakkal. Kukke Subramanya Forest and Bisle Reserve Forest are bordered with Pushpagiri Wildlife Sanctuary. While you visit, you will discover nature's absolute magnificence bejeweled with Kote Abbe Waterfall and Mallalli Falls. Honnamana Kere Lake: Honnamana Kere Lake situated in the Daddamalthe village is the biggest natural lake in Coorg. The still and calm lake looks absolutely stunning amid the lavish green hills, exotic coffee plantations and man-made caves. The celebration is visited particularly amid the Gowri Festival, which is commended in the sanctuary close to the lake. Countless and guests accumulate at this place of worship devoted to Goddess Honnamana, after whom this lake is likewise named. It is trusted that the goddess had yielded her life to spare this town. The alleviating condition and the profound vibes will make your visit to the Honnamana Kere Lake a reviving knowledge. This is likewise one of those prevalent spots to visit in Coorg on the off chance that you need to take a stab at drifting on the round watercraft. Nishani Motte: One of the lesser known places to visit in Coorg, Nishani Motte is a best weekend trekking trail for the people living in Bangalore. The region is a part of Tala Cauvery Wildlife Sanctuary which is home to many wild animals like elephants and leopards. Since this is not an isolated place, it’s recommended you take the trek in the company of a trekking guide. This is the best part of the travelling Coorg. How to Reach Coorg by Air: Mysore Airport, located about 121 km away, is the nearest airport to Coorg and Bangalore Airport 286 km. The airport has scheduled flights to major Indian cities like Kolkata, Mumbai, Bangalore, Chennai, Hyderabad & Delhi. How to Reach Coorg by Road: Karnataka State Road Transport Corporation (KSRTC) provide deluxe buses service to Coorg, on every day from cities like Bangalore, Mysore and Mangalore. How to Reach Coorg by Rail: Mysore Junction, located around 106 km away is the nearest railway station to Coorg.